Economic recovery masks deep divisions that must eventually rip asunder the Atlantic Alliance. To BORROW the title of the book of World War I vintage, "All's Quiet on the Western Front." But superficial impressions can be misleading. The moderate upswing in economic fortunes throughout much of the Western World virtually assured that, from the start, this year's seven-nation Summit of Industrialized Nations in Williamsburg, Virginia, would be a success. With hopes renewed that the gloomiest clouds of the recession were at last lifting, the leaders of the United States, West Germany, Japan, Britain, France, Canada and Italy pledged to keep up the fight against inflation and to back off—for now at least—from the brink of an all-out trade war. The general consensus among the 3,000 or so journalists gathered at the Williamsburg summit site was that the "winner," if there was one, was the host head of state, U.S. President Ronald Reagan. 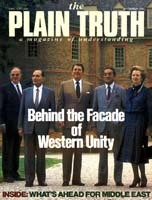 The Times of London correspondent said that the conference marked the occasion "when President Reagan emerged as an international leader of stature, finally managing to shed his cowboy image." Widespread predictions that there could be rancorous bickering over continuing high interest rates in the United States — a contributing factor to the strength of the dollar over the other currencies — simply failed to materialize. Not that frictions over this issue have faded. Immediately after the summit, the beleaguered French franc plummeted against the dollar once more. Anticipating this development, U.S. Treasury Secretary Donald Regan repeatedly stressed at the summit his belief that the real problem is not with a strong dollar. He insisted it lies in lack of confidence in the French currency because of French President Francois Mitterrand's persistence in pursuing costly socialist programs. It may indeed have been "Mr. Reagan's summit." For the first time, the U.S. chief executive found a healthy majority of support for his policies, on economic issues especially, as well as on the broader range of East-West political and security relations. Viewing the activities of this annual "summit of summits" (this writer's fourth such conference), one thing was evident: Just how important confidence in America is to the stability of the entire Western World. This was amply demonstrated by the attempt on the part of the Soviet Union, just as the summit began, to rattle those in attendance. Moscow warned that if the new Pershing II and cruise missiles were indeed deployed in Western Europe beginning at the end of 1983, it might feel compelled to move part of its own Euromissile nuclear force forward into some of its East bloc satellite countries. The Kremlin threat backfired. In an unprecedented show of solidarity, the eight assembled leaders (the Common Market president also attends) unanimously vowed support for the NATO deployment program. The unanimity was all the more surprising considering it entailed support from non-NATO Japan and from France, which maintains a separate defense structure and participates with the alliance only on political matters. Behind the smiles and the optimistic joint statements arrived at in Williamsburg, however, are serious and widening differences, only papered over for now in the pastel bloom of economic recovery. A serious rift between the United States and her allies is only a matter of time. Before the conference, I had the opportunity of talking to several foreign relations experts in three of the many "think tanks" headquartered in Washington, D.C. The upshot of their comments to me: Watch out for the next few months! At the Center of Strategic and International Studies (CSIS), defense analyst Mike Moodie told me that nearly all likely developments in the controversial Euromissile deployment program bode ill for the Western alliance. A less than unanimous decision on the part of NATO's 16 members to proceed with deployment as scheduled would not set well with the United States. A decision to postpone the deployment advocated by some Europeans — would be considered even worse. Manfred Hamm, a West German defense expert with the Heritage Foundation, related the overriding political, rather than military importance of the 1979 NATO decision to proceed with new U.S.-made weapons stationed on European soil to counterbalance the growing Soviet Euromissile force. The West Germans, in particular, are fearful of Europe being "decoupled" from the United States on strategic matters. At first, consideration was given to placing the new weapons aboard submarines offshore of Western Europe. But the Germans felt this plan gave insufficient visibility to the American commitment. Now, should Europeans waver on implementing the NATO game plan, said Mr. Hamm, the United States would certainly be justified in considering the ultimate removal of its ground forces from Europe, rather than exposing them to greater Soviet risk. At the same time, observed Mr. Hamm, the Europeans are deeply concerned that the intercontinental strategic (U.S. — rather than European — based) nuclear weapons that protect them are in danger of being "frozen" into disuse because of the mushrooming nuclear freeze movement in the United States. Particularly alarming to Europeans is the virtual pro-freeze position taken by America's liberal Roman Catholic bishops. West German and French bishops, interestingly enough, have publicly stated their opposition to the thrust of the position taken by their counterparts in America. Western Europeans are worried, too, that the United States is becoming mired in a "new Vietnam" in Central America. Mr. Reagan confirmed their fears during the summit when he removed two key officials from his Central American policy structure, replacing them with individuals considered to be more hard line. According to Mr. Moodie, Central America, along with perhaps the nuclear freeze question, promises to be the most critical foreign policy issue of the 1984 U.S. presidential campaign. "Over the next 18 months," he said, "Central America has the potential to rip us apart again." Logically, said fellow CSIS member William Perry, the United States should seriously consider sending its own troops in. It would take probably no more than 25,000 to do the job, to eliminate the small number of guerrillas in EI Salvador. However, in the wake of Vietnam, U.S. public opinion simply will not permit such action at this time. "The real battleground is this country," Dr. Perry said. There is a definite domino effect possible in Central America, noted Dr. Perry, but it doesn't necessarily include Mexico. Mexico would certainly become more vulnerable should every country below it succumb to Marxist revolution. But he felt that "to go after Mexico," as he put it, would require a deliberate and unlikely decision on the part of Moscow and Havana. One wonders whether North Americans have any inkling of the likely consequences of political turmoil in the unstable region immediately to their south. The fall of South Vietnam led to a few hundred thousand boat people coming to America's shores. Since trouble has erupted in Central America about a million "feet people" have traveled north from Nicaragua and EI Salvador. Already one tenth of EI Salvador's population — roughly 500,000 — is in the United States. Millions upon millions more feet people are destined for the refugee trail — tens of millions if Mexico were involved — if U.S. policy in the region collapses. The strains upon U.S. society would be severe. The controversy over Central America, Mr. Moodie added, "feeds into European relations" and from two opposite angles. Many younger generation Europeans, feeling more sympathy for leftist causes, believe that the U.S. approach to the spreading crisis in Central America is dead wrong. This adds to the impression the majority of young Europeans have about America; namely, that the United States represents a greater threat to world peace than does the Soviet Union. Conservative Europeans, on the other hand, wonder whether the United States any longer has the will to stand up to a threat from Moscow, this time right in America's "front yard." If America can't defend its own interests close to home, reason these Europeans, how can the United States be depended upon to continue to defend Western Europe thousands of miles across the Atlantic? Mr. Moodie recounted a conference in Washington, D.C., dealing with the future of the Atlantic Alliance, at which some European delegates argued very strongly for an independent nuclear capability for Western Europe! Mr. Moodie's remarks brought to mind a letter I received not long ago from an acquaintance in Bonn, West Germany, Eric Sontag. Mr. Sontag is an expert on East — West relations, and especially Eastern propagandist influences on West Germany's youths. He is a great friend of the United States but is greatly disturbed over developments at high levels in the country. In his letter, Mr. Sontag enclosed a copy of a telegram he sent to the U.S. House of Representatives. His telegram read: "IF YOU CANNOT BOX YOUR WAY OUT OF PAPERBAG NICARAGUA AND YOUR BISHOPS FREEZE NUKES, WEST GERMANS BETTER GET THEIR OWN NUCLEAR WEAPONS …." Mr. Sontag appended his copy to me with the additional words: "May sound crazy, but reflects changing attitude of even conservatives here." The lack of confidence in American leadership must ultimately lead to a parting of the ways between the United States and Western. Europe. "Severing the United States connection might well mean more European weapons, not fewer. It would probably mean that nuclear weapons would be more widely distributed than they are at present. Without American nuclear protection, the countries of Western Europe that do not now have such weapons — notably the Federal Republic of Germany — would have strong incentives to get them. "Once the Western Europeans got the bomb," Mr. Mandelbaum continued," others — the Japanese, for instance — might decide to follow suit…. The world might become much more dangerous, chaotic and bloody than it has been since 1945. As the debate about nuclear weapons in Europe proceeds, the chance that such a change might make the world a radically worse place to live is something that we and the Western Europeans — and the Russians — ought to bear in mind." The one nation most concerned about the upset in the nearly four decade — long balance of power in Europe is West Germany. The Federal Republic, up till now, has been content to rely upon the United States for its security. But Germans, observes Luigi Barzini in his latest book, The Europeans, are capable of great swings in national temperament. His chapter dealing with German national character is entitled "The Mutable Germans." Mr. Barzini concludes his book by stating: "The future... will probably be decided, once again, by Germany's decisions. And Germany is, as it always was, a mutable, Proteuslike, unpredictable country, particularly dangerous when it is unhappy." Interestingly enough, the title of Mr. Barzini's book in the German language is translated as The Future of Europe Is in the Hands of Germany. Thus, behind the facade of Western unity evident at the Williamsburg summit lies the prospect of tumultuous political change ahead in U.S. — European relations.